The third left him wondering... what if? What if he had told the woman of his dreams how he felt before his world fell apart? Fuel for Fire is full of action. A team of five from Black Knight Inc spend much of the book trying to escape England after Chelsea's face is plastered all over the world media when she, as part of their undercover mission, helps them hack a very powerful bad guy's computers. The story is also jammed full of heat. Chelsea is the CIA liaison to the Black Knights and has no field experience, something Dagan keeps reminding her of, but she goes undercover anyway. Chelsea has known Dagan since he was a CIA agent and the two of them are crazy about each other and completely unaware of how the other feels. But with all the danger they face and running for their lives, it doesn't take long before they admit their attraction to each other and things between them turn scorching hot. I loved the way their romance is woven through the action story. It kept me engaged from go to whoa. One thing I love about this series is there is always a secondary couple in the background who will become the stars of the next book. In this case we get Christian and Emily, whose fantastic chemistry comes through in their fun banter. Fuel for Fire is another great instalment of the Black Knights Inc series. I'm looking forward to reading Christian and Emily's story, Hot Pursuit. 4.5 stars of brooding complication! This is the tenth book in the series, and Ms. Walker once again manages to create an original plot to back up the romance, making it an exciting read as well as a hot one. As we are in the UK for much of this installment, we get to see members of the wider BKI family. We also get lots of hints of future relationships, which for an ardent fan is great news, as the thought that the end may be near is always a worry! And they will be fabulous stories if the hints are anything to go by! Dagan has been a constant in the BKI family, desperate to compensate for past wrongs, and although at times it was heartbreaking, it was great to finally get his story told and his future settled. That said, it really isn't an easy ride, even if he and Chelsea acknowledge and act on their attraction. After all, everyone has secrets and some have more power than others. My advice is keep the faith, and, if necessary, put your Kindle down for a minute or two, take a deep breath, and carry on. It is very satisfying, if frustrating – and also quite tense – at times. Thank you, Ms. Walker, for another great installment and for the hope that there are more stories to come. 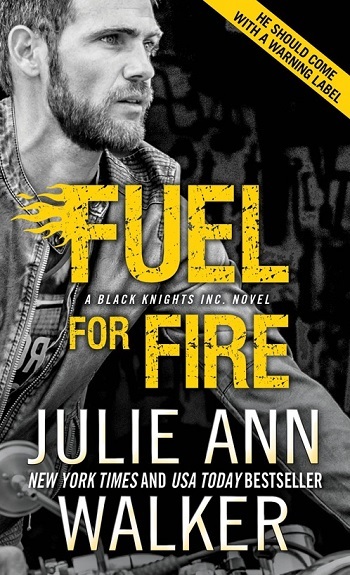 Reviewers on the Wicked Reads Review Team were provided a free copy of Fuel for Fire (Black Knights Inc. #10) by Julie Ann Walker to read and review.